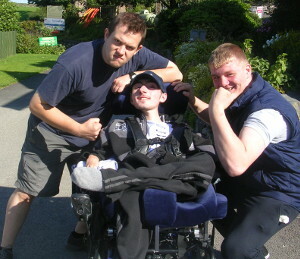 Adam was 18 in 2010 when he visited Calvert Trust Lake District on our Venture holiday. I had never been on anything like PHAB before, so I was a bit nervous at first. But everyone was really friendly and helped to ease my nerves. I met some great people on that first camp I went on and have remained friends with many of them. 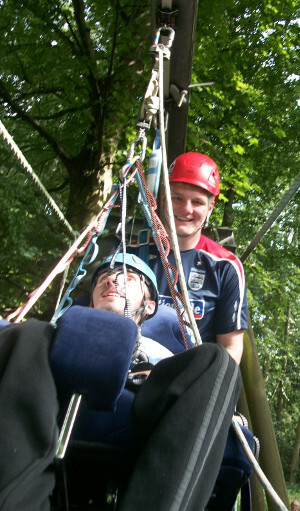 I have Muscular Dystrophy and it's been great to have the opportunity to build a social life through PHAB. I so many great memories but there is one that stands out to me: and that is the day I conquered the Wheelchair Assault Course. I was persuaded to continue and I made it to the end. I really didn't want to go onto the next bridge but I manged to get over the first bridge but I could see the end beyond it which was two planks of wood with a gap in the middle. That was even more terrifying than the one before because the planks would widen apart every time in bounced. I decided to do it quite fast just to end the course. It was one of the bravest things I had ever done up to that point in my life. I was relieved to finish it but also elated. That's the great thing about PHAB - there is always people there to reassure you that if you try hard enough you can overcome obstacles and things that you think that you might not be able to do. At the same time they never force you to do anything you don't want to. They just give you courage to attempt the challenges you face.